Downtown merchants open their doors as the City closes the streets to create the little ones a safe and fun way to trick or treat. With over 40 businesses participating and hundreds of little trick or treaters dressed up along with their families, it's a great community event that you don't want to miss. Over 40 Chamber businesses participate and fun is had by all! 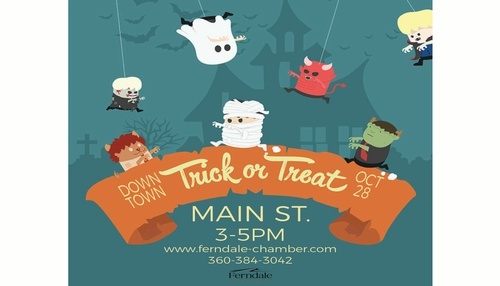 By registering for this event, members are agreeing to be open from 3-5pm on October 29 to distribute candy/goodies to children at either their storefront in downtown Ferndale, or at a booth that they set up in the middle of Main Street between 1st and 3rd Ave. Downtown Ferndale. Streets are shut down on Main Street between 1st and 3rd Ave. Some businesses are located outside the downtown area. Maps will be available around town.